Gorilla tracking in Rwanda and Uganda are both wonderful experiences. That said there are some logistical and practical differences between the two countries to be aware of when planning your trip. For those with limited time, Rwanda is a good bet. From Kigali International Airport to the gorilla tracking region is just a two-hour drive on good roads. You need to be fairly fit to track gorillas but the terrain in Rwanda is generally easier going than in Uganda. Another factor to consider: the Rwandan forest has lots of bamboo compared to Uganda’s more densely-covered canopy. This allows significantly more light through to the forest floor, making your photos much clearer. If Rwanda is best for limited time, Uganda is best for limited budgets. For those on a budget, Uganda is without doubt the best place to track the gorillas (even despite the recent removal of off-peak discounts). Demand is consequently much higher in Uganda, which means you’ll need to purchase your permits even further in advance. A solution that takes advantage of Rwanda's good infrastructure and Uganda's competitive pricing is for visitors to fly to Kigali and drive three hours across the border to track the gorillas of Mgahinga. This gives a boost to a forgotten corner of south-west Uganda. However, it should be noted that there is only one habituated gorilla family there, so permit numbers are limited. Choose your location / accommodation before purchasing your permit. Very simple. No need to specify gorilla family or accommodation. The location of your accommodation is very important. Gorilla tracking starts from numerous points and you’ll want to book accommodation near to your specific entrance point. All gorilla tracking starts at the park headquarters in Kinigi. Most accommodation is within easy driving distance (10 minutes to 1.5 hours). Owing to the remote location, you’ll need a minimum two night stay in the gorilla tracking area. Two night stay is recommended. One night (and even same day) options are available but not recommended. Terrain is often steep, slippery and sometimes muddy. Tracking through the jungle can be tricky and require trackers to hack a path with machetes. Generally easier terrain to climb, except on the longer tracks. Uganda has a huge range of primate, birding, safari and adventure options across the country. The capital Kampala is a buzzing and popular city. Rwanda has a limited (but decent) range of wildlife and safari activities, including Akagera National Park (a “big five” destination) and Nyungwe Forest National Park (for chimp tracking). Eight to 10-hour drive from Entebbe International Airport. Fly-in options to airstrips within 30 minutes’ drive from gorilla tracking areas are available. Two-hour drive from Kigali International Airport. Fly-in options to local airstrips, including helicopter transfers, are available. English. Guides for non-English speakers are available through tour operators. The day will start early, with breakfast around 6 or 7 am, depending on where you are tracking. Your lodge will provide a packed lunch and plenty of drinking water (double check this is provided the day before). Pack your rain gear even if the weather looks fine. The higher you get the more it rains! After breakfast you’ll get a briefing and reminder of the rules and regulations. 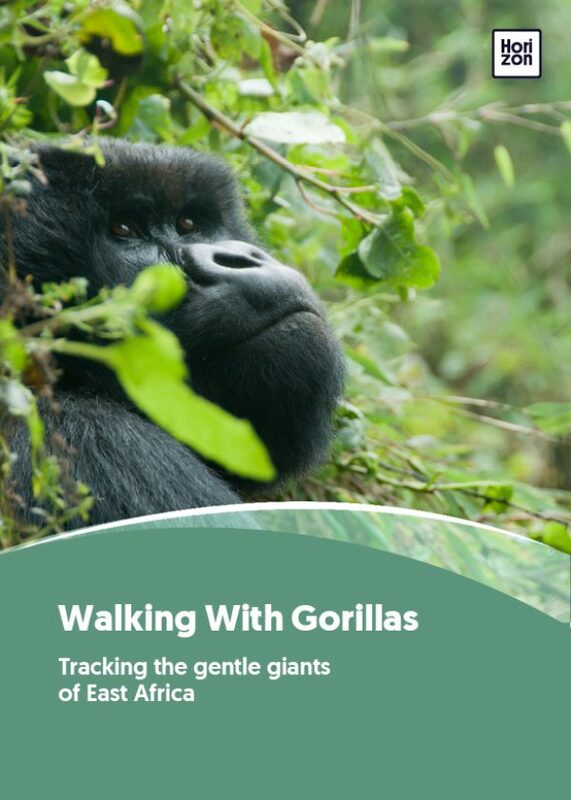 If you’re tracking in Rwanda, you’ll drive to Kinigi park headquarters where your group will be assigned to a gorilla family based on your fitness, ability and preferred hike length. To find the gorillas, you can opt for a short hike (30 minutes to an hour), a medium hike (one to three hours) or a longer trek which may take the whole day. You’ll drive to the start point from the park headquarters. Registration and briefing take place at the Uganda Wildlife Authority park offices from 7:45am and tracking starts at 8:30am. As with Rwanda, you’ll be allocated to a particular gorilla family according to your hike preferences and ability. After the briefing, you’ll either walk or drive to the start point. Setting off from the start point, you’ll generally hike for at least an hour before you find your gorilla family. In some cases it may be three hours or more. The scenery is stunningly beautiful, the hike is all part of the experience. Be sure to keep your own pace and drink plenty of water. It’s easier than you think to get dehydrated, especially at altitude. Your rangers will be in radio contact with each other, passing information from the previous day’s sightings and helping guide you to the right place. As you come within range, the rangers will ask you to leave your bags so you can approach the gorillas more closely. Once you make contact you’ll spend an hour with the gorillas. They may be munching on bamboo, hanging from the trees, grooming each other, suckling their babies, playing, sleeping, farting or mating. Every experience is unique. Take time to enjoy their presence. Remember to come out from behind the camera lens. If the gorillas are on the move you’ll be able to move with them -- keeping the required minimum distance of seven metres at all times. They may show some interest and approach your group. This is normal and nothing to be concerned about. If they approach you, the rangers will ask you to remain calm and step back slowly. Remember you’re allowed just one hour of contact time. Many visitors find the gorillas more interesting when they’re resting, family clustered together, snoozing, grooming and playing. When you approach, ask your guide if they are on the move and, if they are, if you can wait for them to stop before making contact. The route back to your vehicle (or the park headquarters) is usually shorter than the initial hike although it may involve an uphill climb in places. Back at base, you will be rewarded with your gorilla tracking certificate! The ranger guides are immensely knowledgeable and will take good care of you in the forest, helping with your pack and getting you up and down the slopes. Be sure to ask them about the gorillas and other wildlife. They know each gorilla family intimately and can tell you the names and personalities of each individual. Tips for the rangers and porter are discretionary but will be appreciated (see FAQs. Part of the excitement of tracking the gorillas is not knowing exactly where you will find them. The altitude, the dark forest, the rain and mud can make it tiring, but it’s well worth the effort. You will find the gorillas in very different settings depending on your location. You may find them in an open clearing, with clear views and plenty of sunlight or they may be in a denser part of the forest under a thick canopy. Keep this in mind when planning your photos -- flash photography is strictly prohibited. Sightings are not guaranteed but there is a 95% chance or more that you will find your gorilla family. Encountering mountain gorillas is the ultimate wildlife experience: nothing can prepare you for that awe-inspiring moment when you first cast eyes on the silverback, so human-like, so huge and yet so gentle. Kurira was the first silverback I ever saw, the big daddy of the Susa group living on Mount Karisimbi in Rwanda’s Volcanoes National Park. Rules dictate that humans stay seven metres from the gorillas -- but no-one had told Kurira. As I backed nervously into brambles, he moved so close I could almost touch him. Crouching by the bush, he studied its fruits for some time as if choosing the best in a box of chocolates. Delicately he plucked off a single blackberry, tiny in hands the size of baseball gloves, and popped it into his mouth, savouring every bit. In that mesmerising moment, I forgot the gruelling five-hour hike through dense rainforest to reach the gorillas, up and down steep muddy gullies and over paths of fallen bamboo shoots like beds of giant slippery spaghetti underfoot. The Virunga Mountains, spanning Rwanda, DR Congo and Uganda, are home to half the world’s 880 mountain gorillas, with the remainder living in Bwindi Impenetrable National Park, Uganda. Their survival has been one of Africa’s greatest conservation success stories, yet they remain vulnerable to wars, poaching, disease and deforestation. Hence gorilla tracking is carefully regulated. Only eight visitors are allowed to each family and you’re permitted just one hour in their presence once you reach them. But it’s one magical hour: it never fails to amaze me that gorillas are so like us, that there’s this surreal primordial connection with our primate cousins. Guides talk to gorillas in a language of grunts and grumbles. While working on the gorilla habituation experience in Bwindi, I was told to make a long, low rumble, meaning contentment in gorilla-speak, to the silverback Rushenya. When he replied, rumbling back, shivers ran down my spine: in that moment, the connection between us felt real. And gorillas cry, sulk, laugh and smile just like we do. Always multi-tasking, mums chide playful youngsters whilst giving piggybacks or preening their offspring. Others eat constantly, munching crunchy bamboo shoots, nettles and thistles, dribbling green juices down their chins. Hormonal teenagers sulk and slouch while others flirt remorselessly, and cheeky toddlers play peek-a-boo swinging through the trees, fighting and punching their fists in the air. But of all the gorillas I’ve encountered, Byishimo is my favourite. I first saw him as a tiny three-month old baby stuck to his mother’s breast with his twin sister Impano on the other. The first twins to survive in fifty years of mountain gorilla conservation, they looked like a fluffy black bikini. Ten years later, I went to find them again. Impano, with her own baby, stayed away. But Byishimo, now a burly blackback, was breathtakingly beautiful. A true star, he played with babies and rolled in grasses, almost posing for the camera as if he knew he was special. That hour in his company flashed by like seconds, but will stay with me forever. In both Uganda and Rwanda the gorilla tracking permits are highly regulated systems, enabling the authorities to control human-gorilla interaction and generate much-needed revenue. The availability of permits is limited by the number of habituated gorilla families and the number of visitors allowed per family. The authorities allow a maximum one hour interaction with the gorillas per day. With 15 habituated gorilla families in Uganda and a maximum of eight visitors per group, there are a total of 120 permits available per day. In Rwanda, there are 10 habituated gorilla families and a maximum of eight visitors per group, making a total of 80 permits available per day. What is a gorilla tacking permit? A permit allows entry into the national park and one hour with the mountain gorillas, accompanied by a ranger guide. Back at base, you will be rewarded with bragging rights in the form of a gorilla tracking certificate. How much does a gorilla tracking permit cost? A permit in Rwanda costs US $1,500 per person. A permit in Uganda costs US $600 per person. Each permit is printed with a unique serial number and the traveller’s personal details. They are non-transferable and non-refundable. Gorilla tracking permits must be paid for in full and purchased in advance. If you plan to travel during peak season or if you are in a large group, you should book six months or more in advance. Peak seasons are June to October and Christmas and the New Year. The earlier you book the more choice you have on where you track and where you stay. Last minute bookings may be possible during low season or with smaller groups. Gorilla tracking permits can be purchased up to two years in advance through the Uganda Wildlife Authority (UWA) or the Rwanda Tourism Board (RTB) or via a registered tour company. A good tour operator offers in-depth and local knowledge. They will have visited the lodges personally and will be familiar with the proximity of each gorilla family. This knowledge can prove invaluable when planning your trip. A good tour operator will employ reliable ground staff, including good drivers who know the terrain well and can negotiate the steep dirt tracks. If you plan to extend your trip after you have seen the gorillas, a tour operator can provide a well-planned itinerary and organise your other activities, accommodation and transfers. If booking your trip with a tour operator, be sure to check the gorilla tracking permit is included in the price. Some people choose to make their own arrangements: purchasing their own permits, booking accommodation and visiting independently. Counterintuitively this can work out more expensive than booking with an operator. If you plan to travel independently, leave plenty of time to allow for any hiccups. Remember that permits are non-refundable and non-transferable, so if you run into transport problems you may miss your slot to see the gorillas. Tourists are only allowed to visit and interact with habituated gorilla families. Habituation is a gradual process through which the gorillas get used to the presence of humans. This allows people to visit them without affecting their daily lives or natural behaviour. The maximum group size for tracking the gorillas is eight people (plus rangers and porters). Your group is allowed a maximum of one hour with the gorillas. Visitors to the gorillas must be over the age of 15. Tracking in thick forest at an altitude of over 2,000 metres (6,560 ft) can be tough. It is often wet. Gorilla trackers must be fit and in good health. You should not go gorilla tracking if you have diarrhoea, flu or a cold. Gorillas have no immunity to most human diseases and even mild human infections can be lethal to a gorilla. You are obliged to inform the authorities if you are sick and they will decide if you are well enough to visit the gorillas. Remember that the lives of the critically endangered gorillas are more important than your holiday. If you need to sneeze or cough, cover your nose and mouth to reduce the chance of spreading infection. Don't spit or leave litter in the forest. Gorillas can catch diseases from human rubbish. Always leave a distance of seven metres between you and the gorillas. If the gorillas start moving towards you, the rangers may advise you to move away from them. If a gorilla charges, do not run away. Avoid direct eye contact until the gorilla has moved away. Stay calm and slowly crouch down. Stay in your group. Do not crowd or surround the gorillas. If you need to go to the toilet in the forest, tell your guide and he will dig a hole for you. Cover the hole afterwards to prevent spreading disease to the gorillas. Follow these simple, common-sense rules and your visit will be a positive one -- for the gorillas as well as yourself. Keeping our gorillas healthy and happy is a never-ending task but luckily we have two very important allies -- tourists and coffee. Both have come to play large and important roles in our conservation work. Over the years I’ve come to realise that tourism can be an important force for conservation, through my work with Conservation Through Public Health (CTPH). CTPH is a grassroots Ugandan and US-registered non-profit organisation that promotes conservation by enabling people and gorillas to coexist in and around protected areas. CTPH was founded in 2003 after an outbreak of a fatal skin disease among the Bwindi gorillas was traced to people living near the park who had limited access to basic health care and other social services. At our main field station at Buhoma village, at Bwindi Impenetrable National Park’s main tourist site, we have developed three programmes: Wildlife health and conservation; community health; and alternative livelihoods. That’s where the coffee comes in, but more on that later. At our specially-built Gorilla Health and Community Conservation Centre, we are constantly on the lookout for diseases that the animals could pick up from the livestock and humans who share their habitats. We have a Human and Gorilla Conflict resolution team made up of local community volunteers trained by the Uganda Wildlife Authority to chase gorillas back to the park when they stray into community land. We have also helped to set up a network of 81 Village Health and Conservation Team volunteers to work with villagers around Bwindi, promoting good health and hygiene practices, and explaining why gorilla and forest conservation is important for them. This vital work means that when gorillas do stray out of the park they are less likely to pick up human diseases and be harmed. Now for the coffee: We have a social enterprise that improves the livelihoods of farmers around Bwindi by buying their good coffee at a premium, and selling it locally and internationally. A donation from every bag of Gorilla Conservation Coffee sold goes to support the CTPH’s conservation and community health work. By developing the production of coffee, we reduce the local farmers’ dependence on the gorillas’ habitat for food and wood fuel. Tourists can be taken on a coffee safari and get to understand that by enjoying a cup of coffee they are helping gorillas in a very direct way. I have come to realise that tourism can be an important force for conservation. Real ecotourism isn’t just about minimising the negative effect that visitors can have on wildlife. It is about positively protecting habitats, creating economic incentives for conservation, and giving back to the surrounding human communities. Tourism has been hugely important for mountain gorilla conservation because it has created economic benefits for local communities and the national economy. This means both local people and the authorities have an incentive to protect and conserve the gorillas’ habitat. Without that incentive, the future for these magnificent animals would be a lot less certain. The mountain gorilla is critically endangered, so it is essential that tourist activity causes no harm to the species, or to individual animals. Humans and gorillas share over 98 per cent genetic material and can easily pass on infections to each other. So visitors must take precautions such as not visiting when they’re ill, and keeping a safe distance at all times. And because gorilla tourism brings in great economic benefits to the government, the local community and tour operators, there is a lot of pressure to habituate even more gorilla groups and make them available to visits by tourists. Currently, 50 per cent of Bwindi gorillas are habituated for tourism and research, but habituation puts the animals at risk. They lose their fear of humans inside the park and outside, when they stray into community land, and habituated gorillas are also at greater risk from contracting human diseases. All this means they have to be followed and managed every day of their lives, whether or not there are visitors. Although tourism plays an important role, it’s essential we leave some gorillas free to live a normal life away from our prying eyes.